Just to be clear: I am not complaining about the sunshine, blue sky, and cozy 80 degree days my fellow Austinites and I have been enjoying lately. However, when these days grace us deep in the heart of winter, to this Kansas transplant, they bring with them an ominous feel. After already enduring 6 murderously hot Texas summers, I never look forward to a temperature rise, and these gloriously beautiful days are an all too frequent reminder of what is in store as we make our way around the year. So, what’s a girl to do to calm her nerves and lessen her dread about the impending swelter? Think cold thoughts! My latest project outside of my non-traditional student musings brings me back to a frigid Maine night over the holidays. It was so cold that we didn’t want to make the quarter mile trek through the snow to Ruski’s (a delightfully dive-y neighborhood tavern in Portland). So on that frozen night we hunkered down with two fingers of scotch and a game of cribbage. I am very much a brand new cribbage-phile. The scotch? I’m still trying to make myself not gag. Whether I ever learn to love it or not, I love the dazzling color it makes against crystal, and I knew I had to paint it. I started this painting using the very traditional method of painting only values over an underpainting. Since I may be the world’s worst multi-tasker, I find taking this approach has really helped me get started: Now, instead of attempting to mix the perfect color and place it in the perfect spot, I’m just filling in the painting with one color and white until each part of the composition fits relative to the rest. The static in my head is completely tuned out. It doesn’t look all that great, but it alleviates the trepidation that a stark white canvas lends itself to. 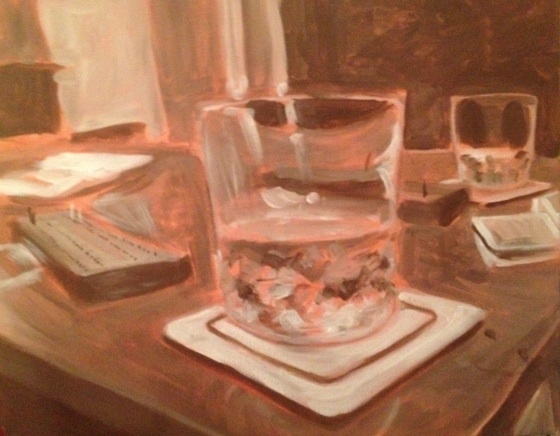 When I started on the glass, it was so apparent that I was letting myself be much looser and freer with the brush than I have been in the past. My painting-to-staring-at-the-canvas ratio has certainly increased. I don’t know whether this liberating lack of obsession with perfection stems from the imposed time limit experienced in class, or just the volume of things I’ve worked on lately (which makes each new canvas less daunting than the last), but I’m pleasantly surprised and I know there is only one way to ensure it continues–keeping paint on that brush! Full disclosure, after the cribbage game, and the scotch, I’m pretty sure we still went to Ruski’s. When in Maine…. Even if you do not like Scotch, your mind is thirsty and your eye ravenous for seeing. Good work. And I truly know what Maine winters can be like having lived there for a few years. Thank you! We generally try to make most of our Maine visits happen when we need a reprieve from the oppressive heat in the summer, though I thoroughly enjoy the frigidness when I know we are only a booked plane ride away from relief! I completely understand. It was always interesting hiking from the Portland airport to the parking lot wearing flimsy shoes and seeing others wearing shorts during a blizzard. Haha! Yep, I’ve been there before :). 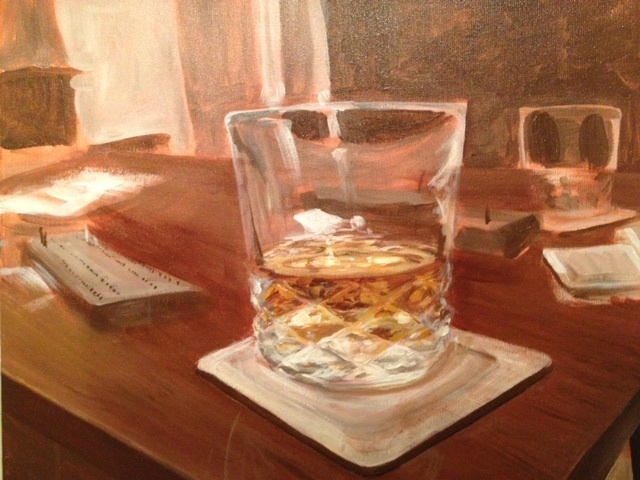 Lovely work on the glass and the scotch. And the backstory creates such an atmosphere for the painting. Good job! Keep it up! Thanks, Heather! Loved your new work and story as well! I loved your sparkling glass painting. One day I hope to visit Texas. It might be in the summer, so I am forewarned. Make sure to bring your flip-flops! And thank you!